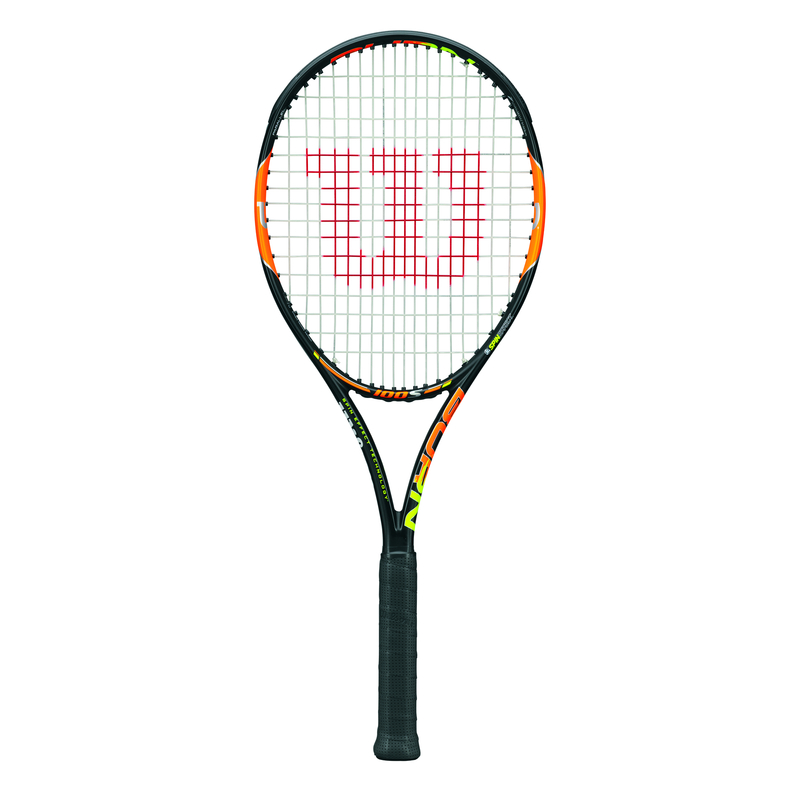 CHICAGO, January 19, 2014 – Wilson Sporting Goods Co., announced today the introduction of the BURN family of rackets. This new line is built specifically for performance tennis players seeking a bold, sleek racket that accelerates power from the baseline. The BURN is the first Baseliner-focused product to emerge from the Company’s new PlayerID system, which categorizes three key types of tennis playing styles: Baseliner, Attacker and All Courter. The system helps athletes better select products that speak to their playing style and enhance their overall performance on the court. The BURN line consists of five rackets, each with a headsize of 100 square inches. Each BURN racket is constructed with High Performance Carbon Fiber, which increases frame stiffness for explosive power on groundstrokes. And the BURN comes with the X2 Shaft, a longer handle that allows for increased feel and leverage on two-handed backhands, and an optimal shaft shape to enable quick grip changes for extreme grips. The rackets also feature Parallel Drilling, which dramatically increase their sweet spot, while providing a forgiving feel. In addition, the BURN 100S, BURN 100LS, and BURN 100ULS rackets are equipped with the Company’s Spin Effect technology and differ in weight, allowing juniors to work their way up within the BURN family of rackets as they grow. Current top-ten players and Wilson Advisory Staff members Kei Nishikori and Simona Halep will be two of the first athletes to play competitively with the new BURN during the 2015 Australian Open in Melbourne. Consumers are invited to visit www.wilson.com/burn for more information on the BURN family of rackets and to register for pre-sale notification. Pre-sale for the BURN 100S and BURN 100ULS begins February 2, and for the BURN100LS and the BURN 100 on March 2. Pre-sales will be available on www.wilson.com/burn and major tennis retailer websites. The BURN will retail for $199. The BURN racket will be in retail stores in mid-February. The BURN is the first Baseliner-focused product to emerge from the Company’s innovative PlayerID system, which allows tennis players to easily identify the appropriate Wilson racket model based on individual play style. After identifying which playing style they belong to, athletes can quickly narrow their racket search by model type and weight. Every racket for Wilson will correspond with one of the three playing style segments, streamlining the racket selection process and ensuring a player’s equipment is best suited for his or her style of play. For more information and product specifications on the full line of Wilson BURN rackets, log on to www.wilson.com/burnthebaseline. Chicago-based Wilson Sporting Goods Co., a division of Amer Sports, is the world’s leading manufacturer of sports equipment, apparel and accessories. Wilson is the global leader in performance tennis and uses player insights to develop products that push tennis equipment innovation into new territories. Through its dedication to creating products that enable athletes at every level to perform at their best, Wilson has earned its place as a leader in sporting goods for over a century.